A rich history. A thriving present. In 1908, Judge T.M. Kennerly and Rev. Frederkck F. Huhns discussed the need for a church in the Houston Heights. These two men led a meeting in a hall above Simon Lewis’ store at 403 West 19th Street on May 31, 1908. At the meeting, nineteen people agreed to organize Baptist Temple, and Rev. Huhns was called to be the church’s first pastor. The congregation continued to meet in this space for the next five years. 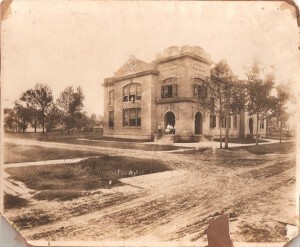 Then in 1911, Baptist Temple began work on its first building at the corner of 20th and Rutland Streets, land which had been donated by the Houston Heights Company. This is where the church has been located ever since. In 1927, T.C. Jester became the church’s fourth pastor. Dr. Jester was recognized as a leader in his church, in his denomination, and in civic affairs. Under his leadership, the Baptist Temple became one of the leading churches in Houston, and most of our present church buildings were either built or remodeled during his tenure. During the next decades, Baptist Temple prospered under a series of remarkable pastors. Despite the decline in the number of people involved in our weekly activities, the church added new facilities and undertook new mission and ministry projects. Today, led by Pastor Kelly K. Burkhart, Baptist Temple is still building on the great legacy and heritage of faith left by these predecessors. We have a healthy respect for our rich history and tradition, but we are also firmly planted in the present. We desire to be the presence of Christ in our community and our world in ways that are relevant and accessible to all people. Recent days have been marked by growth, vision, and a focus on the future. These days are marked by a prayerful awareness of God’s movement among us and plans being enacted to consolidate our current footprint and fully renovate the T.C. Jester Building. We have committed ourselves to the task of rebuilding, renewing, and restoring this congregation to fully realize its God-given potential. Nineteen members had a vision for a powerful community of faith in the Houston Heights for the 20th Century. That vision carries us on into the 21st Century.